Star chaser Altior is "at his most vulnerable" of a first defeat over jumps at Newbury on Saturday, admits trainer Nicky Henderson. The eight-year-old has won all 11 of his starts in hurdles and over fences but has not raced this season following a procedure to improve his breathing. He is expected to defend the Exchange Chase and face in-form Politologue and last year's runner-up Fox Norton. "He's going to get beaten one day, probably," said Henderson. "I think you've got to look at it that way," added the trainer, a three-time winner of the race. 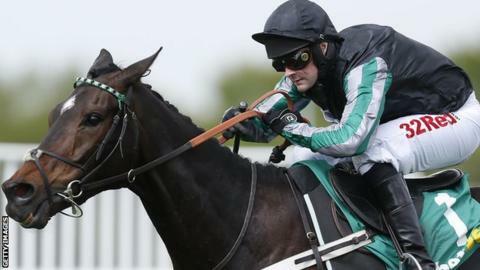 Altior, seen by many as 'the next Sprinter Sacre' in terms of being a major standard-bearer for the champion trainer, won the two-mile race - formerly known as the Game Spirit Chase - by 13 lengths on the way to taking the Cheltenham Festival's Arkle Trophy and the Celebration Chase at Sandown last year. This season's long-time target has been the Queen Mother Champion Chase at Cheltenham and Henderson says of the challenges awaiting his horse on Saturday: "They are as good as they are going to be in March [at Cheltenham], but I've got to be realistic about this - I'd like to get a race into him and if he gets beaten, he gets beaten. "I suppose that this is the time that he's going to be at his most vulnerable, but in the interests of him trying to win the Champion Chase I think it's good for him to have a run." Remarkably, alongside Altior, the Lambourn-based Henderson team also contains Might Bite, the leading fancy for the Cheltenham Gold Cup, and Buveur D'Air, red-hot favourite to retain the Champion Hurdler's crown at Cheltenham. All are reported in sparkling form, though when it comes to discussing Altior their trainer admits he would "buy another week" of preparation. "He schooled [over fences] last week, and was fantastic, but he was nearly too fantastic, he was so fresh, so exuberant, and I'd love to have a bit more time to take the freshness out of him. "But his work is fantastic, his wind [breathing] is fantastic, his jumping is fantastic, he's in excellent shape." Asked about the horse's reputation as 'heir to Sprinter', Henderson added: "He's come quite a long way into filling some very big boots, but he's still got quite small feet, but they are growing, and if they keep growing who knows?" The Game Spirit Chase and Denman Chase - in which Cheltenham Gold Cup third Native River is due to take on Cloudy Dream, trained now by Ruth Jefferson following the recent death of her father Malcolm - headlines Newbury's 'Super Saturday' along with the Betfair Handicap Hurdle. Henderson, successful in the feature hurdle on a record five occasions, has five hopefuls this time, including Jenkins, who is due to be ridden by 16-year-old 'wonderkid' jockey James Bowen. The teenager, who sprung to prominence when winning the Welsh Grand National in January, is tipped as a future champion. Son of trainer Peter Bowen and his wife Karen, he is a 'conditional' jockey with the Henderson team, consequently his allowance will remove three precious pounds from Jenkins' welter-weight. "It's nearly frightening to think that James is only 16 - he's got a lot of natural talent, just like his [jockey] brother Sean. "They're lovely boys, and they've had an enormous amount of practice, in terms of pony racing and point-to-pointing, that's all they've ever done, ride, ride and ride." "It's a pleasure to have him here," he said, "and I'm rather hoping that he'll probably see me out - it would be nice to think he'll be here for a very long time."